As we approach the end of 2018, our focus starts to shift from reviewing everything we achieved this year — and celebrating through the holidays — to getting a head start on realizing your 2019 goals. So, we thought this would be the perfect occasion to publish Part 1 of our Property Data API Buyer’s Guide — helping you make smart investment decisions for your business and catapult you into a successful new year. It is our mission to drive better decision making and remove barriers to accessing only the data you need, when you need it. So, whether you are a developer looking for the right property data integration for your custom application or you are a business leader looking for data to enhance existing services to your customers, we — the property data API experts — have the information you need to make informed decisions when it comes to your data vendor investment with our new Property Data API Buyer’s Guide series. We have identified a range of key attributes to consider when choosing your property data integration based on the offerings of other data providers as well as our own. We will be releasing bite-sized articles over the next few weeks to cover these attributes, starting with Ease of Use. One of the most important steps for a successful API integration is to, “make it easy for developers to get started.”1 Our developers especially appreciate this product attribute, but business leaders can also appreciate the benefit of reducing inefficiencies with 3rd party vendor integrations and avoiding having some of their most specialized people working on non-business critical assignments. Attaining access to over 20 billion property data points (150 data fields for over 135 million properties) isn’t always fast and uncomplicated, but it can be. Our research shows that among 6 other vendors studied, the Estated API is the only current provider of a self-serve model for customers — no waiting, no added hassle. Is ease of use your top priority? Visit our API documentation page and get a key to get started today. How important is ease of use relative to your internal workflows? Will you need an API that is dead simple to use so that you can prototype rapidly? Or will you be expecting a longer sales cycle due to integrations with an established part of your business that require some additional forethought and coordination? These details will help define how highly to prioritize the simplicity of the API integration in your decision making. What additional ease of use factors should you consider? Make sure to investigate how many endpoints your prospective vendor uses. In this case, more is not better. The Estated API provides a single endpoint that houses all 150+ data points for each property, but many vendors have up to 40 different endpoints that supply the distinct property fields from which you might need to access information. 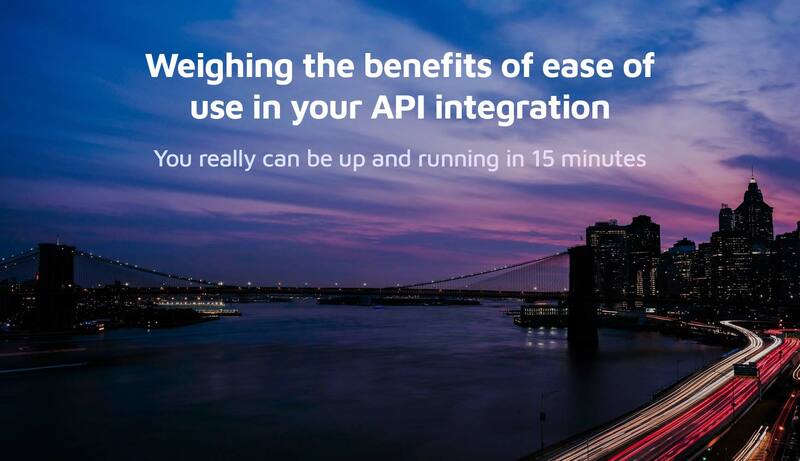 The more endpoints you need to call through your API, the more complex the documentation will be for your integration and the slower your implementation will be over all. Lastly, the number of endpoints affects the efficiency in which the data is returned to your application. A single endpoint return will be concise and digestible whereas a return from multiple endpoints for one property could provide extra work from your engineers — who will need to organize the information just as you need it. Keep in mind that pricing is generated per endpoint call, so the more endpoints, the higher to cost to you - but we will address this point more fully in Part 2 of the Buyer’s Guide. What does an easy to use API look like in practice? Very easy: A self-serve sign-up process where in less than 15 minutes and in a few steps the user can be fully up and running. With the Estated API, a developer simply creates an account, chooses the pricing plan that works for them, pays online and receives an API access key to millions of property records instantly. Not easy: Some API services require that you contact a salesperson in order to sign up to get a key that allows you to access any data, no matter the size or scope of your project. Your progress is then 100% dependent on the responsiveness of your provider and might be subject to a contractual obligation. One venture-backed early stage insurance startup recently conveyed to us how easy and instrumental the Estated API integration has been to the growth of their business. A smooth and simple implementation was highly valuable for their small and nimble team. As an instant insurance quote provider they have been able to build and test synchronously how data gets pulled into their application, helping them progress toward product launch targets. If you are looking for even more ideas on how to power your products or services with property data, read our recent article that touches on its use in a range of industries. No matter what stage your business is in, or how far along you are in your initiative to integrate a data API into your product, make sure to consider how easily it can be integrated and how that could impact your business. So, whether you need a special contract or self-serve sign up, 1 or 300 data fields, or you have 2 or 1,000 employees, your priority for ease of use ultimately comes down to how you intend to use the data to create value in your own business. We hope this content has been helpful. We are always excited to learn new ways that businesses make better decisions or provide better services to their customers through property data. Help us build our next buyer’s guide by sharing in a short survey how you use property data to power your business. And, stay tuned for Part 2 of the API Buyer’s Guide and our complete, downloadable full buyer’s guide available in January 2019!